The creative color and design will project a powerful presence whether you’re performing on stage or anywhere else. 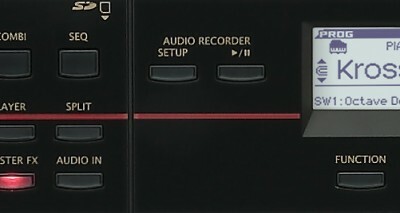 The top panel as seen by the player is a sleek black color, while the rear and side panels visible by the audience use a bold, red color scheme. The two models feature different design concepts; the 61-key model is designed for active mobile use, while the 88-key model has a sophisticated design that looks great on stage. In spite of being packed with functionality, the KROSS is lightweight and highly portable. The 61-key model with its distinctive rear bar is amazingly light; at only 4.3 kg/9.5 lb, it’s the most portable in its category. 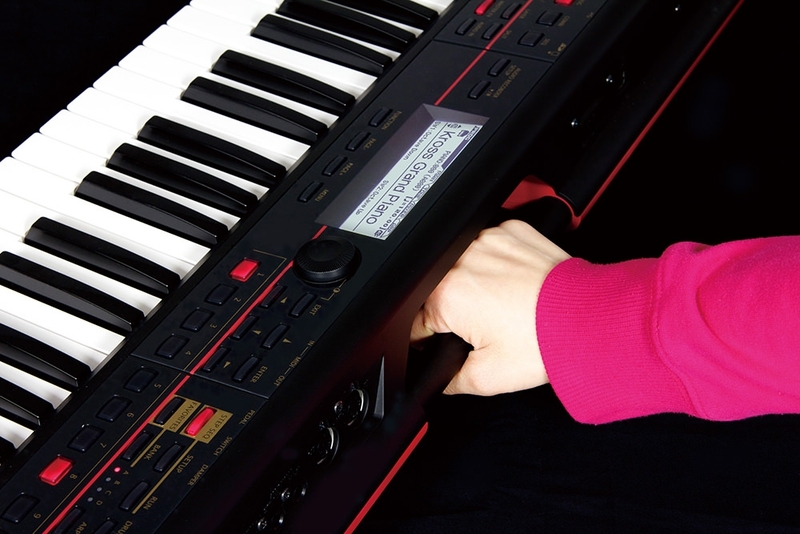 The 88-key model packs a piano-touch hammer action keyboard into a mere 12.4 kg/27.3 lbs. The grand piano features lavishly-sampled decays with three levels of velocity as well as reproducing the noises produced by the damper pedal, ensuring that every nuance of your performance is reflected in the sound. 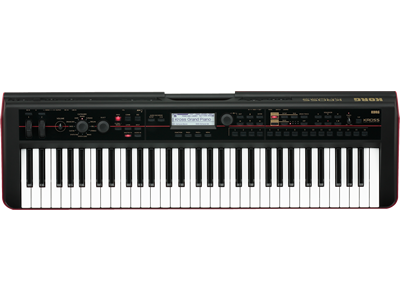 Also included are an upright piano (unusual for a PCM synth), as well as distinctive sounds from Korg’s famed SG-1D Sampling Grand and M1 Music Workstation. The five classic electric piano sounds are just as expressive as the acoustic piano sounds; they also include effect settings, giving you a complete package of the performance-ready sounds that you want. Because of its portability, the KROSS will be used in a wide range of situations, and that’s why it provides a broad variety of sounds that surpasses even the flagship models of the previous generation. 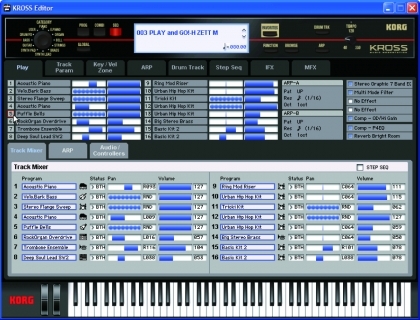 The PCM data is approximately twice as large as preceding models such as the X50 and the PS60. Staples such as the frequently-used rock/jazz organ, strings, brass, and synth sounds have been brushed up. 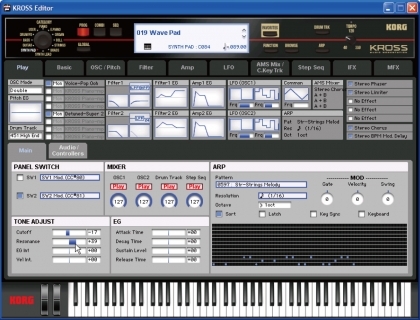 There are also instruments such as toy piano, accordion, combo organ, church organ, and even vintage instruments such as a tape sampler, as well as bell-type sounds and the sounds you need for cutting-edge dance music and electronica – unique sounds that have not been included in a synth of this class. Our design goal has been to make KROSS the only instrument you need. Ranging from standards such as delay, reverb, chorus, flanger, and rotary speaker, and also including amp modeling powered by Korg’s proprietary “REMS” modeling technology, and even a robot voice vocoder, you can choose from 134 different high-quality effects. 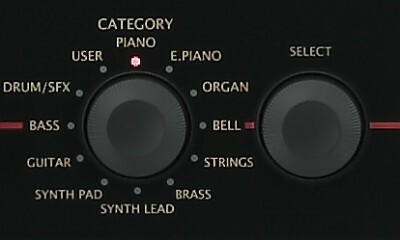 First use the category dial to choose the broad category such as piano, electric piano, organ, bell, synths, basses, or strings. 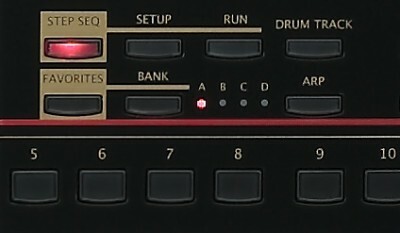 Then turn the select dial to find the sound you want. It’s a quick way to focus on selecting the needed sounds without being distracted by sounds of another type. Sounds that you’ve created or that you use frequently can be registered to four banks of 16 buttons, giving you a total of 64 sounds that can be recalled at a single touch. This is a real convenience during live performances or song production. The MIC IN jack (1/4″ phone jack) lets you directly connect a mic. 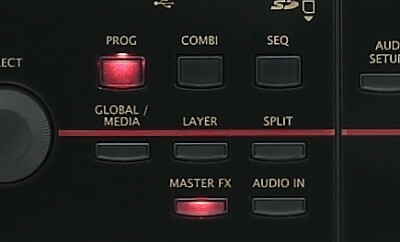 If you’re a vocalist as well as a player, there’s no need to obtain a separate mixer. In addition, there’s a LINE IN jack (stereo 1/8″ jack) for you to connect your audio player, giving you the option of performing along with the playback in a variety of situations on stage or anywhere else you go. 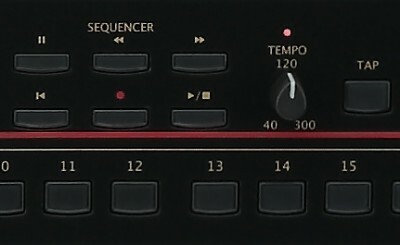 The KROSS features a step sequencer inherited from the popular Electribe series. It’s a simple design in which you use the sixteen buttons to turn individual notes on or off, allowing you to quickly and easily create original rhythm patterns of up to 64 steps.